After CME released the New UF series full-function Master Keyboards, which became the most welcomed product among the MIDI keyboard. 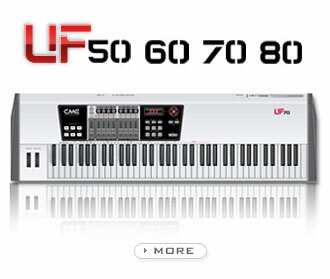 The UF 50/60/70/80 range from 49 to 88 keys with semi-weighted and hammer action weighted keys and also features world’s first keyboard with build-in duplex wireless MIDI system and optional multifunctional expansion board. The New UF series master keyboard provides all-new circuit design, with the practicality and versatility of a modern master keyboard. 9 assignable control faders, preset functions including volume for 1-16 channels and master volume, and drawbar for organ sounds. LED data display, control button including program, transpose, octave, channel, keyboard split. 6 sequencer remote buttons, including REC, PLAY, STOP, FAST REWIND, REWIND AND RETURN TO START, etc. Panel page and layer button, data adjustment knobs.